Mango is always the right choice in summer for making any recipes. Whether it is shakes & smoothies or any special dessert like Mango balls with yogurt & nutty dry fruits, every recipes have its own taste and different looks. Here, I am presenting the same Mango in a different style. 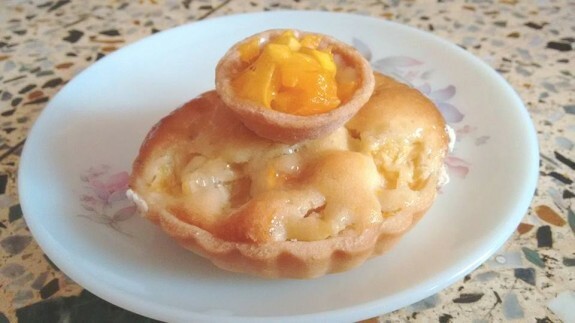 Mango Almond Tart is a very delicious dessert. I make 2 Tart with 1 bigger one and 1 small one to make it more appealing to all. If you want, you can only make 1 tart as the taste will remain same. Try this recipe at home and serve it to your family to feel yourself very special to everyone. 1.Combine all the ingredients flour, butter, sugar, whole egg, salt and almond in a food processor. Whizz the ingredients until a smooth dough forms. 2. Turn the dough in a lightly floured surface and knead lightly until smooth. Wrap in a plastic and set in the refrigerator for about 1-2 hour to chill. 3. In the meantime, you can make the mango custard. Mix the custard powder in a 100 ml of orange juice. Heat the remaining juice in a pan until boil. 4. Take out the boiling orange juice from the heat and add it on the custard and mix properly. 5. Again heat the custard mixture and stir it continuously for about 1 minute or until nicely thickened. 6. Now, add the mango pieces and again cook for 1 minute. Stir continuously while cooking. Take off the heat and keep it aside for cooling. 7. Take 2/3 Pastry from the dough and roll out in a lightly floured surface until large enough to line the base and the side with ¼ inch thickness and a removable bottom mold. 8. Prick the base with a fork and sprinkle breadcrumbs over it. Then spread the mango custard over it. 9. Roll out the remaining pastry and cut into strips. You can also make another small open tart and for this keep some pastry dough for this. Now, arrange the strips over the filling in a criss-cross pattern. 10. Whisk egg yolk with 2 Tbsp water and brush it on the pastry strips to glaze. 11. Preheat the oven to 180 degree C and place the tart to the oven. Bake it for 30minutes and check in between at least once. Remove from the oven and cool on a wire rack. 12. Do the same process for baking the small tart. But here, you need to keep only 10-15mins or less on the oven to bake the small one. 13. Serve it cool by placing the small tart on the bigger one. Fill the small tart with 1 Tbsp of chopped mangoes.